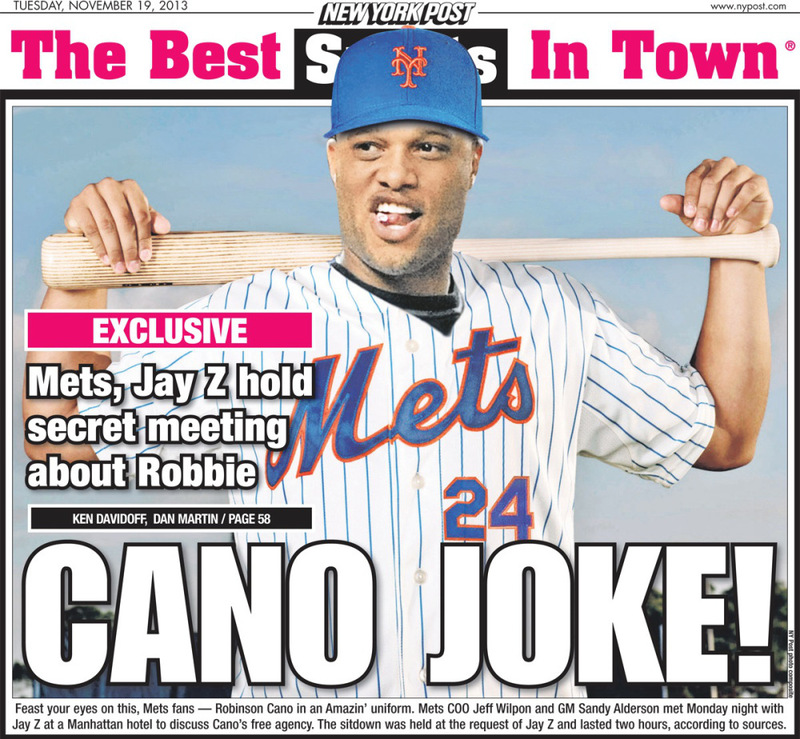 The Mets Meet With Jay-Z To Discuss Robinson Cano, Wait, What?! On Monday night the New York Post reported exclusively that New York Mets COO Jeff Wilpon, GM Sandy Alderson, and assistant GM John Ricco met with agent Jay-Z at a hotel in Manhattan to talk about his client, free agent second baseman, Robinson Cano. Sandy Alderson had already stated this fall that he doesn’t see the Mets, in any way, signing a player to a $100+ million contract. That would have immediately taken Cano, OF’s Jacoby Ellsbury and Shin-Soo Choo off the board. So what’s the deal with this meeting for Cano? Is it a play to get fans to buy season tickets and put hope into the fans, or are the Mets finally listening to the fans and willing to open the checkbook and sign a mega free agent and improve the offense? In my opinion, this is all BS. It’s just a ploy to get the fans excited and to make it seem like they’re actually doing something. We all know that there’s no way the Mets are diving into the $100 million contract pool again, at least just yet. Robinson Cano isn’t just only going to get more than $100 million, but he’s going to come awfully close to $200 million and the Mets have never come close to giving out that type of contract before. The most expensive contacts that the Mets have ever given were the $138 million extension to third baseman David Wright, and the $136 million contract given to starting pitcher, Johan Santana. And we all know how that Santana contract turned out. Also, the Mets have a competent player at 2B already, and it’s Daniel Murphy. Murphy has improved quite a bit defensively at second and has shown to have a solid bat for the position. Murphy can hit .290+, add in a handful of doubles, and 5-10 homers. Now, there have been a lot of rumblings that the Mets may trade Murphy this off-season as a few teams like him a lot and have inquired about him. So the Mets could sign Cano and trade Murphy, but, and in my opinion, instead of throwing $125+ million at Cano, shouldn’t the Mets be giving Wilmer Flores a shot to start at second base with his elite prospect bat? Flores has shown he can hit at all levels in the minors and was given some looks with the big league club but struggled a bit with consistency and injuries. You could possibly add a really solid bat at second base at the league minimum, instead of signing Cano to a mammoth contract that could handcuff the franchise for years. Not to mention, Cano lollygags and takes plenty of plays off during games. He has shown not to hustle out grounders and gap hits, and be a lazy player. Why throw so much money at a player who doesn’t have a high drive for the game? I’m not saying that Cano isn’t an elite talent, he’s arguably the best second baseman in the league, but he does have flaws and has yet to show he can be a leader as well. I’m also not saying that Flores can or will be the next Cano, but I firmly believe that he can be a very solid hitter at the major league level, albeit with below-average defense. Flores will cost next-to-nothing, while Cano could cripple the franchise with the contract he’ll get. All of the Mets’ money this off-season would undoubtedly go towards Cano, which shouldn’t happen. The Mets need to spread the money around (if they even have any), and address the numerous needs they have, like shortstop, two corner outfielders, backup catcher, and back-end of the rotation. As much of a beast Robinson Cano is, he is not what the Mets should be targeting at this moment. Second base is not a top need, and his new contract could severely backfire. It doesn’t matter anyway though, as this is all just a way to get excitement into the fans and instill some fear in the Yankees to pony up the money to re-sign Cano. Robby wants to be a Yankee, the Yankee’s want him back, and no other teams are going to come close to giving Cano what he wants. Still, it’s going to take some time before Cano and the Yankees finally agree on a new contract, so I wouldn’t be too surprised if a team like the Dodgers, Tigers, Rangers, or Nationals swoop through and make a strong run for Cano or at least, offer big money. Ultimately though, I see Cano in pinstripes next off-season and coming nowhere close to playing in Queens for 81 games a season. And one other thing, this meeting was initiated by Cano’s other agents, Brodie Van Wagenen and Juan Perez, so there’s a good chance that the Mets are just kicking the tires as they have nothing to lose by meeting with Cano’s agents. This will sell a few extra tickets and get the Yankee’s attention a bit to up their offer and save themselves from losing their biggest offensive piece. It’s good strategy by Cano’s agents, but shouldn’t they have instead met with Magic Johnson, who partially owns the Los Angeles Dodgers and actually has the money to sign Cano? Meeting with the Mets isn’t exactly too much of a threat and won’t instill much fear in the Yankees, as the Mets has slashed payroll for three straight years and supposedly only have $30 million to spend this off-season. This is all just a big joke and pathetic ploy by both the Mets and Cano’s agents to instill hope in the Mets’ fans and instill fear into the Yankees. Unfortunately, I don’t see it working out well for either parties and this will just backfire on both ends. Seriously, how pathetic. The Mets think it’s a big joke to put hope in the fans that they’re actually willing to spend, and spend on a superstar like Cano. No one’s falling for it and this will only enrage the fans even more when the Mets don’t even come close to being a serious contender for Cano’s services. The jig is up Wilpon’s, Alderson, and company, time to put up or shut up. And what do I mean by “put up or shut up”? I mean, spend money to improve this sad team already or sell the team and get a serious GM in here who doesn’t make jokes about the teams financial situation. This isn’t funny anymore and the fans deserve better and deserve a championship caliber team again. This entry was posted on November 20, 2013 by stevep. It was filed under Uncategorized .